Hubert Munyazikwiye is the author of SportsMarketing.fr, the leading French blog on sports marketing. Founded in 2007, SportsMarketing.fr focuses on highlighting brand activation across the world of sports. Hubert's articles are written in French but would welcome having English guest writers contribute to the site to share more insights and activation from the United States. Over the past few weeks, sports fans across the globe have been captivated by the excitement and competition generated around the 2011 Women's World Cup. The competition, held in Germany, has attracted many leading brands across the world who are looking to engage fans in new ways. Amongst FIFA Sponsors, adidas has clearly emerged as the leading brand activating around the 2011 Women's World Cup. Adidas created a special microsite, referred to as the adidas Weltmeisterin 2031, which invites parents to register the birth of their daughter to receive a baby starter kit, complete with a pair of football shoes, a shirt, shorts, and a ball. With the creation of the Weltmeisterin 2031 campaign, adidas can directly contribute to the creation of the next great generation of female soccer stars in Germany, particularly those who could could compete for their nation during the 2031 Fifa Women's World Cup. Allianz, a global financial services company headquartered in Munich, dedicated a section of its website to the Women's World Cup. The company partnered with a collection of brand ambassadors (current and former players) as well as Steffi Jones, President of the Organizing Committee, to create a series of short video clips and exclusive blog editorials. Allianz dedicated a section of its site to highlight its Junior Football Tournament, an initiative that provides 14-16 year old soccer players in Munich with an ultimate soccer experience. During the tournament, Allianz leverages its partnership with FC Bayern Munich to provide participants with training sessions from pro coaches, autograph sessions with FC Bayern Munich players, and a tour of the team's stadium and trophy room. As the Official IT Provider of the FIFA Women's World Cup, Deutsche Telekom created an interesting CSR initiative where the company announced that it will donate 10,000 euros for every goal scored during the tournament. The initiative, entitled Herzrasen, will benefit a charity named "A heart for a child". Commerzbank, a financial institution that is in charge of the Women's World Cup Volunteer Program, created an exclusive online diary for soccer enthusiasts to follow throughout the tournament. The diary, referred to as the Fan Block, features contributions from Birgit Prinz (the best goal scorer in the World Cup), Marko Marin (a German soccer player), and a select fan, Amelie Herberg. Credit Agricole, a French financial institution, created a video content initiative on their official Facebook page that is designed to drive awareness for the team. 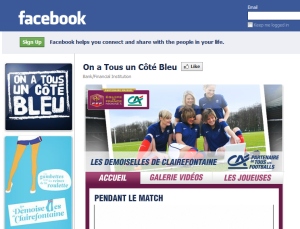 The campaign, referred to as "Les Demoiselles de Clairefontaine", profiles players on the French national team by asking them fun questions about their live off the field. Surprisingly, Nike has done little to support the Women's World Cup in France. The only remarkable initiative the brand has executed to date is an animation of Laure Boulleau's Facebook page, who is one of the most prominent and attractive players on the French National team. The page features a lot of content (imagery and video) highlighting her and her teammates.